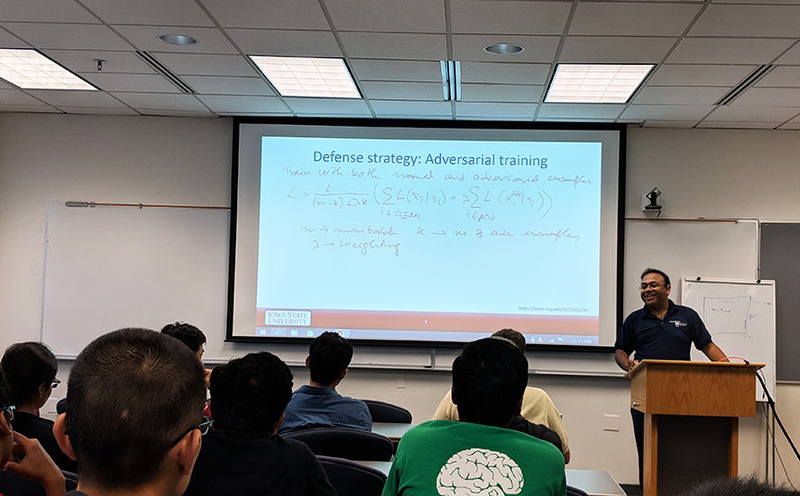 Soumik Sarkar, assistant professor of mechanical engineering, leads a talk on machine learning in a new College of Engineering faculty-led lecture series. The lectures are designed to support continuous learning and collaboration in new, fast-moving areas of research. Cyclone Engineers are staying at the forefront of emerging, cross-disciplinary areas of research with the help of a new faculty-led lecture series. Launched last fall, Iowa State engineering faculty, post docs and grad students are coming together to exchange expertise focused on fast-moving areas of engineering. The initial lecture series topic was machine learning. Different faculty lectured on different aspects of new papers in the field, drawing a large, cross-department audience. According to Sriram Sundararajan, associate dean for academic affairs, the lecture participants’ outstanding engagement is perhaps as valuable as the content itself. With a successful first series completed, the College of Engineering is seeking topics and organizers for future series. Contact Sriram Sundararajan and Arun Somani to get involved.